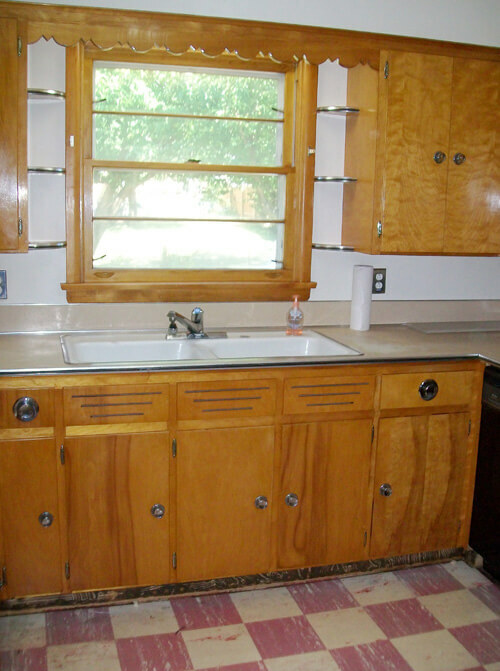 Laurie decided to keep the original laminate counter tops (#5 on Pam’s Most Endangered List.) 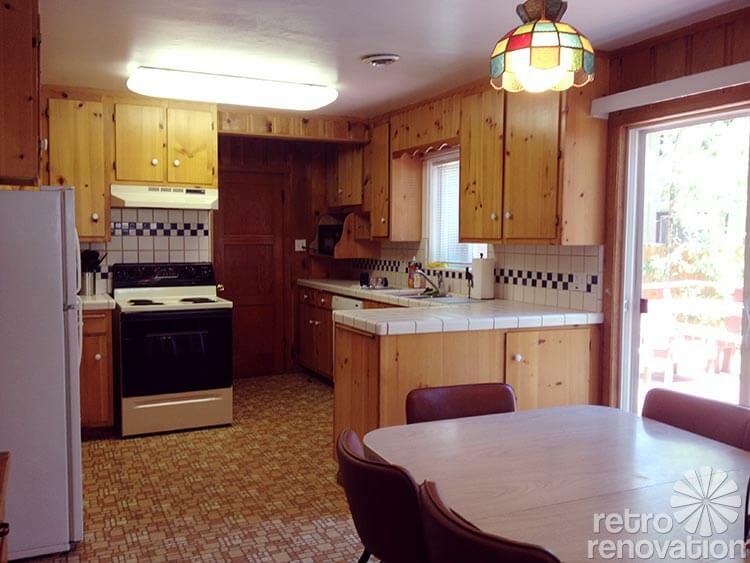 She also told us would be keeping the original red-and-beige checkerboard resilient floors. ***See Pam’s boxed comment at the end of this article about making sure you know what materials are in your old floors. Fear not Laurie! The answer to your retro design dilemma is as easy as doodling… atomic doodling that is. 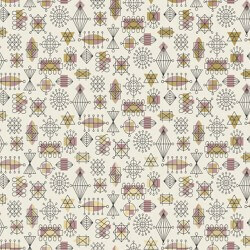 Upon seeing Laurie’s kitchen, Pam immediately suggested this wallpaper from Bradbury & Bradbury called Atomic Doodle. 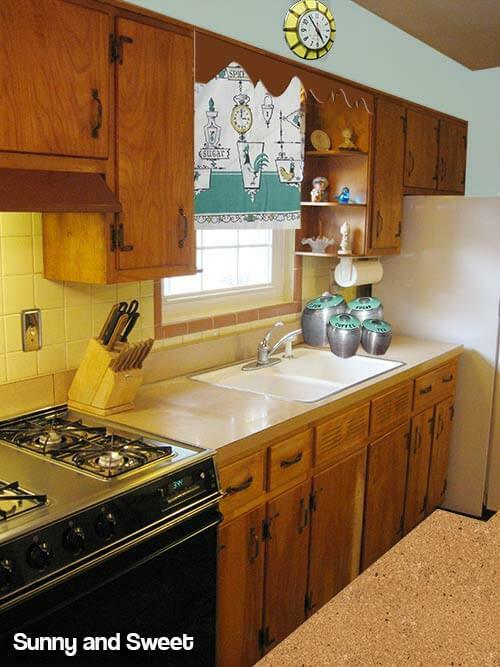 The colors in this wallpaper coordinate perfectly with Laurie’s kitchen. 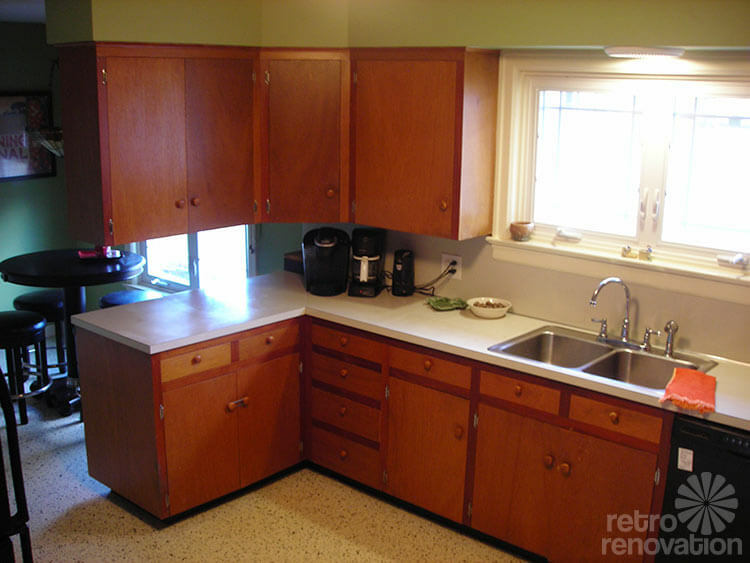 The metallic copper on the wallpaper (which reads almost as a yellow) echos the original, warm wood cabinets and tan laminate counter tops. 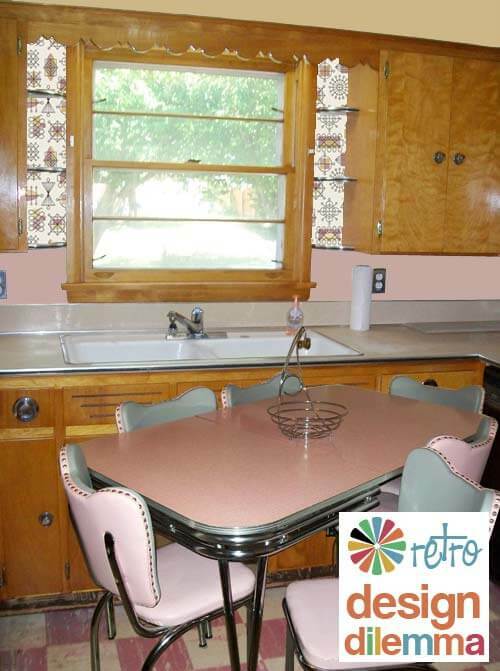 And, the pink blends with her checkerboard floor and dinette set (which incidently was featured on Retro Renovation before — in the story about reupholstering retro dinette chairs affordably). 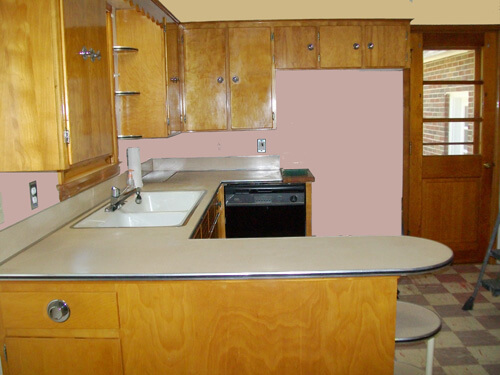 I also “moved in” Laurie’s pink and chrome dinette set so that she could get a sense of how everything would come together. I picked the light pink and the golden yellow right off of the wallpaper pattern. 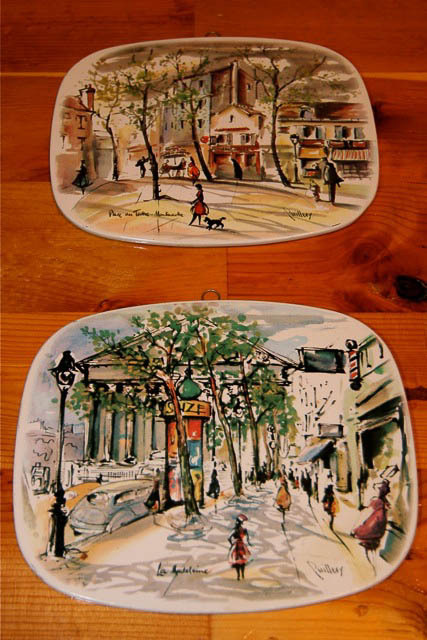 To add some interest, Laurie could order one roll of Atomic Doodle wallpaper and use it sparingly in small areas in her kitchen — namely as a backdrop for her small rounded shelves on either side of the window (which would be great to display vintage glassware, small dishes or even a retro salt and pepper shaker collection). 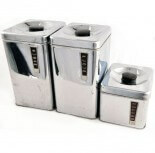 Laurie mentioned having a set of chrome canisters, possibly similar to these, which will work nicely in her space. Keep in mind that Laurie has purchased white appliances — which will help to break up all the color and pattern that is going on in the room. 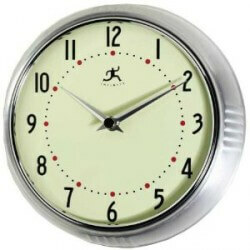 Adding a new or vintage chrome rimmed clock on one of the soffits would echo all of the chrome accents in her table, counter edging and cabinet pulls. As far as window treatments go, I’m a big fan of cafe curtains. If Laurie opts to add the little bits of Atomic Doodle wallpaper near the window, I’d keep the curtains a solid color — probably white or a coordinating yellow. Cafe curtains are relatively easy to make and install with little to no sewing involved. Heck, I made the cafe curtains for my kitchen windows without sewing at all! Pam has covered cafe curtains before — in her post 15 cafe curtain designs and ideas — which is both full of ideas and information on how to make your own cafe curtains. So there you have it Laurie, hopefully you can rest easy — well once all your moving and unpacking is done! Do you have a room that causes you to lose sleep? 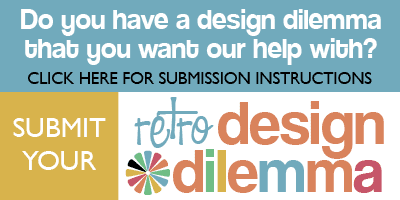 See our instructions for submitting your retro design dilemma. Pam and I are here to help! Pam takes over for Kate here: In our email exchanges, I reminded Laurie that her that vintage floors may contain nastiness such as asbestos, and that she should consult with properly licensed professionals to determine what is in her floors and how to handle. I do not give this kind of advice on the blog… and I edit out any reader comments suggesting what others should do. 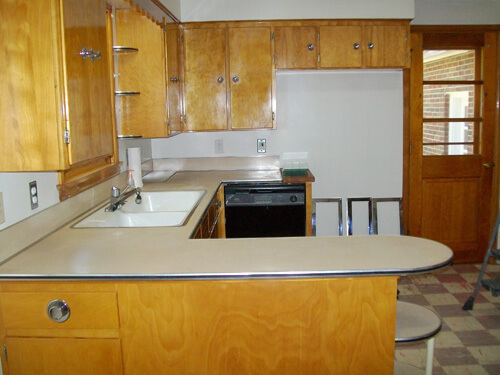 Again, homeowners: Consult with properly licensed pros to determine what’s in the original materials in your particular old house and how to handle safely. 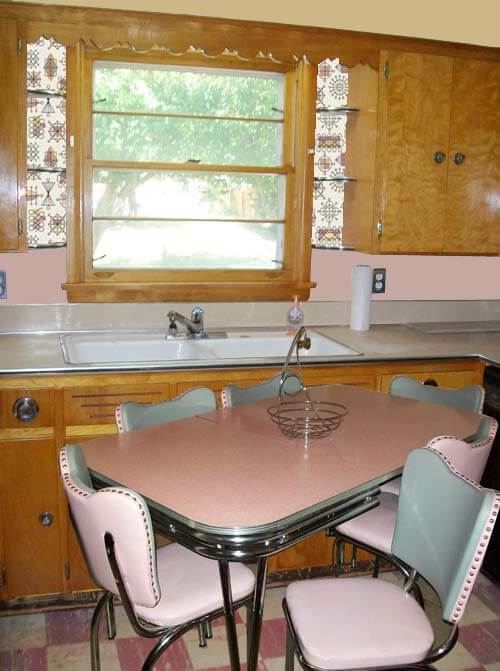 My vote is for pink appliances… I know I know.. she already bought white ones… That table and chairs are just begging for pink appliances though. did you resolve the dishwasher/ fridge area, Lauren?